Trying to fix the faulty microwave oven is not safe if you don’t have the experience and tools. All the same, you still need this small appliance repaired in no time. With our help, you have both needs covered. 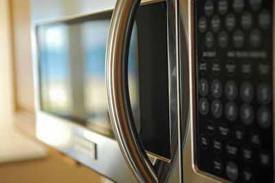 We provide timely microwave repair Los Angeles service correctly. With our quick service, we make sure you can use the appliance again in no time. We are insured and trained to repair most makes and their models. Whether you own an old microwave or a high-end model, you can turn to our company. With Excellence Appliance Repair Service, effective work is guaranteed. Aware of how useful your small kitchen appliance is, we respond quickly to do any required microwave oven repair in LA, California. Call us no matter what problem you experience. Our techs are equipped to diagnose microwave issues and provide the necessary service. Don’t use the appliance if you notice sparks or damaged wires. Contact us to replace the worn parts and find out what makes your microwave malfunction. Our pros are expert microwave repair technicians. On top of that, we only use the best tools available to identify appliance problems. We have experience in such small appliances although some models are not very small. All the same, you can trust us to fix drawer, built-in, countertop, and above-the-range microwave ovens. On top of fixing microwaves, our techs can also install the built-in and drawer models. Call us for such services too. We assure you that we have the experience to fit new microwaves and make all connections right. Our team is also available for routine microwave service in Los Angeles during which we check and tune up the appliance to prolong its life expectancy and keep it working free of hassle. You can trust our team for any service related to this small appliance. Contact us today if you want fast microwave repair in Los Angeles.